It was hailed by UK Chancellor George Osborne as a “new dawn” – but serious questions remain about the security implications of Britain’s nuclear energy deal with China. The UK government has refused to say whether China’s planned investment in the British nuclear industry was approved by the National Security Council – the body that assess the risks from foreign investment in critical national infrastructure projects. 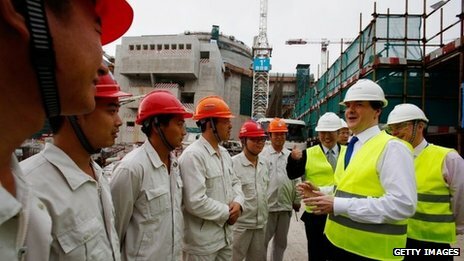 In the future Chinese firms could become “majority owners of a British nuclear power plant subject to British safety rules and policed by the British,” said Mr Osborne. Tim Yeo, chairman of Parliament’s energy and climate change committee, said Britain should “warmly welcome investment from China in the nuclear industry” but said he did not know whether the National Security Council had formally discussed or approved the investment. “It would be a great pity if on some security reason this was thrown back into jeopardy.” he told BBC Radio 4’s The World Tonight. But other members of Mr Yeo’s committee are worried. Conservative MP Dr Phillip Lee said it was “perverse” and “Orwellian” to allow Chinese state owned firms a role in critical infrastructure projects like nuclear power at a time when questions over Chinese cyber-attacks on the west had not been resolved. The Chinese could not take away a nuclear power station in the event of tension between the two countries but they could “virtually switch it off” if they wanted to, he claimed. It would also bind Britain’s hands in respect of China diplomatically, when it comes to speaking out on human rights. On the website of the China National Nuclear Corporation – one of the companies connected to the Hinkley project – the company boasts openly of its military links. “China National Nuclear Corporation (CNNC) is the large state-owned enterprise under the direct management of the central government. Historically, CNNC successfully developed the atomic bomb, hydrogen bomb and nuclear submarines and built the first nuclear plant in the main land of China. CNNC is the main body of the national nuclear technology industry, the core of the national strategic nuclear deterrence”. Hinkley Point C is set to take 10 years to become fully operational. 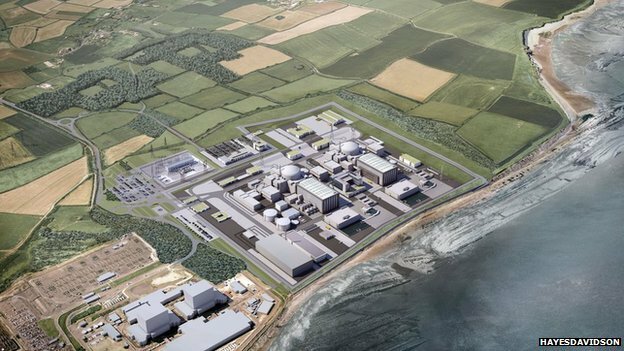 It will be made up of two nuclear reactors and will be built next to Hinkley Point A and B. Just days after George Osborne made his nuclear announcement Chinese state-run TV was showing-off its nuclear armed submarines for the first time in 42 years accompanied by rousing music. Official Chinese news agency Xinhua called the subs an “assassin’s mace that would make adversaries tremble”. Labour MP Dr Alan Whitehead, also a member of the energy and climate change committee called the Chinese nuclear company CNNC an “arm of the state”. “There doesn’t appear to be a clear distinction between the role of the Chinese National Nuclear Corporation in developing civil nuclear and developing and forwarding military nuclear,” he told the World Tonight. He said the Chinese military – the People’s Liberation Army – would be involved in some of the decisions made by the firm. He has called on the UK government to state publicly how the investment in critical national infrastructure was approved and by whom. Nuclear expert Mark Hibbs, of the Carnegie Endowment for International Peace, said the decision to invest in the British nuclear project would have been a “strategic decision” that would have been approved by China’s State Council – the nation’s ruling executive. The UK Cabinet Office said in a statement that “the process for dealing with such issues falls under the aegis of the National Security Council”. It said the government had “put in place an approach which enables it to assess the risks associated with foreign investment and develop strategies to manage them. The National Security Council “brings together the economic and security arms of the government and is the forum that ultimately balances the risks and opportunities of inward investment decisions,” added the Cabinet Office statement. But despite repeated requests the Cabinet Office has refused to say whether Chinese investment in Hinkley or the possible full majority ownership of nuclear reactors in the future has been formally discussed, assessed or approved by the National Security Council. Critics fear Britain may be sleepwalking into nuclear relationship with China it will regret especially if in years to come China wants to introduce its own nuclear technology to the UK. “The Chinese domestic nuclear programme certainly leaves much to be desired” says Dr Paul Dorfman of the University College London Energy Institute. He is worried by the lack of transparency in the Chinese nuclear industry and cites the arrest and dismissal by the Chinese Government in August 2009 of the President of CNNC in a £260m corruption case involving allegations of “bid-rigging in nuclear power construction”. Chinese investment in key energy infrastructure is “deeply problematic,” he said and industry experts were worried about “China’s weak regulatory structures”. 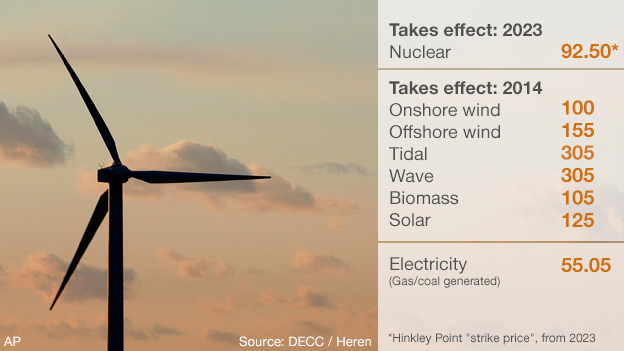 The economics of the Hinkley C project have also been slammed. Peter Atherton of the respected city firm Liberum Capital said they were “flabbergasted” by the deal. At £8bn per reactor, Hinkley Point is “the most expensive power station in the world (excluding hydro schemes) on a per megawatt basis,” said Mr Atherton. He said the French and Chinese state owned firms would earn between £65bn and £80bn in dividends from British consumers over the project’s lifetime. “The UK government was taking a massive bet that fossil fuel prices will be extremely high in the future. If that bet proves wrong then this contract will look economically insane when HPC (Hinkley Point C) commissions” added Mr Atherton. Tim Yeo said the budget was so high “because they have factored in a much bigger contingency in to this project”. But he added: “I do believe it is in Britain’s interests to have part of its electricity generated by nuclear power.